So far, Madeleine has also been seen in: Italy, Sweden, Portugal, Spain, Morocco, Majorca, Belgium, Bosnia, France, Australia, Brazil, Wales, Malta, Italy and Dorset. She got there on a boat? A security guard at the store in Dunedin on New Zealand’s South Island was convinced the child was Madeleine. She asked the girl her name and she replied in a British accent: “Hailey.” Then she was led away by a portly man in shorts who grabbed her hand. In. New. Zealand. Aisling Symes? A girl whose face was so familiar to the world’s media, and who could be recognised by a store detective in New Zealand, made it from Portugal to, well, New Zealand. And the police ignored this vital clue. Shame on them. We armchair detectives would have done better. 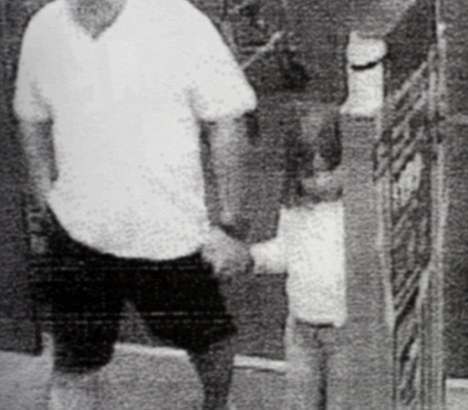 The files reportedly comprise hundreds of pages of information, including CCTV images that show a young girl who looks like Madeleine being led into a New Zealand supermarket in 2007. In December 2007, to be exact, the year Madeleine McCann went missing and became the media’s Our Maddie. The photos were never released to the media. Should they have been? Is there a law that says all media must see all pictures submitted to the police of Our Maddie? Is there a golden rule that all images must be published in said media? These are “THE SECRET SIGHTINGS”. No, not secret from the police. Secret from you. Helpfully, we’ve got he picture and can entertain you with it. See that grainy image of the girl and the man’s chubby legs. Two of the CCTV images were taken in New Zealand on December 5, 2007, and forwarded to Portuguese police by Interpol. In one photo a little blonde girl peeps out from under her fringe as she is led into a shop by a portly man wearing shorts. In the other the girl is seen leaving the shop with the man and a little boy. She has the same hairstyle as Maddie when she went missing on May 3 that year from a holiday apartment in Portugal aged three. She’s got the Our Maddie Cut. It’s caught on. Any other sightings? A girl described as “a little elf” – in a pyjama top like the one Maddie had on when she was taken – was spotted being “summoned” from a shop near Murcia, Spain, by an “unkempt” man 12 days later. In August 2008, a woman reported a Newcastle man acting suspiciously in Villamoura, 50 miles from Praia da Luz. Geordie behaving oddly…? Was he not wearing a Newcastle FC shirt and looking emotional? She says the man, who she also saw in May 2006, took pictures of her children. In July 2008, a Scottish mum reported seeing a blonde girl who looked like Madeleine in Albufeira, Portugal, with a group of gipsies. Yeah, its’ the gypsies. Let’s get them again. Anything else? First the fat man. Then the gypsies. Then the paedos! It’s the usual suspects. As for this fat man in the New Zealand shop, the Mail calls the news and the CCTV footage “astonishing”. More than 50 sightings stretching from Europe to the US, Hong Kong and New Zealand are contained in a disturbing 2,000-page police document in Portugal. Why is it disturbing? Are your disturbed by the sightings? By the police? Or by how a missing child became a global obsession? After three summer’s of reporting, the media has come up with a single clue as to what happened to Our Maddie. Their spokesman Clarence Mitchell added: “They are incredibly frustrated that this was sitting there and being disregarded by the Portuguese police. They were shocked when they saw the scale of the information that had come in and the lack of action taken. There are potential leads in the file that are now being followed up by our investigators. And the McCanns can now look. They have the documents. And they may well have the money soon, as they seek libel damages from Goncalo Amaral.